Property Details: 3 Bedroom, 2 Bathroom Gulf-front Home with 1200+ square feet. Lagoon Run condominium home, Gulf Shores Alabama real estate sales. This furnished condo unit makes for a delightful vacation home or year-round residence! On the third floor of the Lagoon Run condominium, this corner unit enjoys excellent views of Little Lagoon as well as the Gulf, and will pay high dividends for investors looking to rent it out. 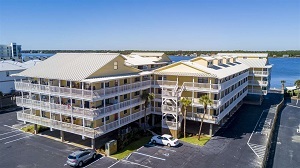 The lagoon-front condo puts you within walking distance of Gulf Shores' magnificent beaches, and just a short drive from popular restaurants & shopping sites including The Hangout, Alvin's Island, Gulf Island Grill, and much more! Some of the home's distinctive features include: Walk-In Closet in Master Bedroom, Vaulted Ceiling in Living Room, and Breakfast Bar in Kitchen. Open Floor Plan between Living/Dining areas. All bedrooms have Ceiling Fans, and upstairs Guest Bedroom is oversized for accommodating plenty of friends & family! Best of all is the Wrap-around balcony, perfect for outdoor dining and endless views of the water. Don't miss out on your chance to own a beautiful waterfront home! Come see this resort home at Lagoon Run Condos in Gulf Shores AL.